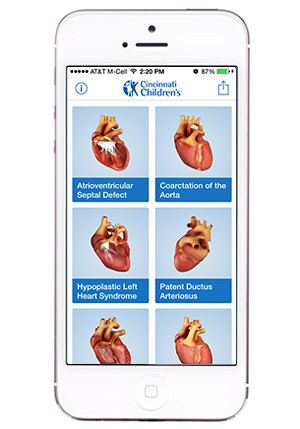 To educate families about the heart, Cincinnati Children’s Hospital Medical Center offers an interactive, 3D app for iPhones and iPads and Android Devices. The app shows anatomically accurate images of congenital heart defects and repairs of those defects. Congenital heart defects can be difficult to visualize and explain. The Heartpedia mobile app provides a variety of anatomically-correct, three-dimensional interactive heart models. Healthcare providers may use these models as visual learning tools to help educate patients and families on specific defects and repairs. The Heartpedia app may also be helpful to patients and families who want to learn more on their own or to share the details of a defect with concerned friends and family. Cincinnati Children’s believes that supplying the right information and tools ultimately results in the highest level of care and the best outcomes. Click here to see a demonstration of the Heartpedia Mobile App.